A Vortex is a giant magnet of energy that is either positive or negatively charged. Positive charged vortexes have feminine attributes: nurturing, calming and tranquil or yin. Negative vortexes are masculine, active, energizing or yang. 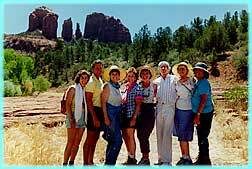 There are fifteen vortex sites within a ten mile radius of Sedona. This is what makes Sedona so very powerful. You are literally moving in and out of masculine and feminine magnetic energy fields as you move from site to site. The advantage is that you can intuitively choose the energy you require for a given day. If you need nurturing and wish to enhance your intuition, you would choose a feminine site. For energizing, empowerment and activation you would choose a masculine vortex site. Sedona’s rock formations are composed of basalt, sandstone, limestone and ferrous oxide mixed with the sandstone…giving the red rocks their brilliant crimson color. The iron ore and the silicon dioxide or sandstone accounts for the magnetic energy of the red rocks. For centuries these giant monoliths have served native people’s as a natural shrine or church for prayer, meditation and connection with Great Spirit, Creator and what we term God. Tribal shamans came to Sedona for thousands of years to pray, seek guidance and alignment for their people. While they came here for vision quests, ceremony and ritual, they never lived here in the red rock country - it was considered to be sacred. The four most famous and powerful vortexes are Cathedral Rock (positive-feminine), Bell Rock (negative-masculine), Airport Mesa (negative-masculine) and Boynton Canyon (a balance of both energies). A vortex is a place of concentrated energy that people can sense. It is usually a result of positioning: Where two or more energy meridians, called "ley lines," intersect on the earth's grid. Many of the sacred temples and cathedrals around the world are built on these natural earth energy centers. People who were guided to put them there, usually just said that the location 'just felt right'. A “man made” vortex site can be created by setting one’s intention… The earth remembers this intention and some of the people who come at a future time may sense that energy.